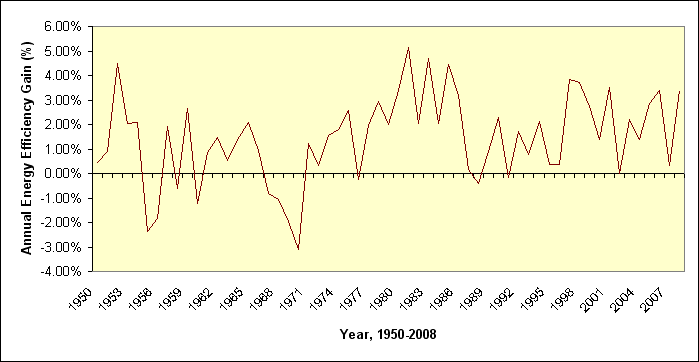 As the above graph illustrates, the amount of energy (in BTU) required to produce a dollar of GDP has been dropping steadily, from close to 20,000 BTU in 1949 to 8,500 BTU in 2008. Just how fast has that drop been occurring? 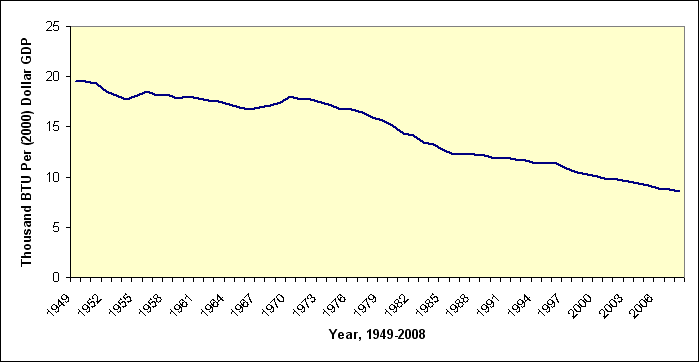 This graph illustrates the rate of annual efficiency gains from 1950 onward, measured as the increase in dollars of GDP per thousand BTU . During and after periods of high energy prices, energy efficiency rose quickly, as in the late 70’s and early 80’s, and again from 2002 until today. Overall, the mean rate of annual energy efficiency gains in the economy is 1.44%. At this rate, the energy required to produce a dollar of GDP drops in half every 50 years . Can the US do better? At its peak in 1981, annual energy efficiency rose by 5 percent. Sustained annual increases of 5% would halve the energy intensity of the economy in less than 15 years! In other words, the US could maintain its current $14 trillion dollar economy while using half the coal, oil, and natural gas that it uses today. More realistically, the US might attempt to match the efficiency gains it racked up from 1978 to 1985, when annual efficiency increases averaged 3.3%. Sustaining this pace would halve energy intensity every 20 years. With even the more optimistic predictions of the EIA and IEA indicating a potential oil supply crunch in the next few decades, reducing energy intensity is key to maintaining and improving world prosperity. For the US, many of the easy gains are gone, as outsourcing manufacturing improved US efficiency by moving energy intensive industries overseas. Further decreases in energy intensity will have to come from actual increases in energy efficiency, and from an increase in the quantity and relative value of low-energy products like online services and media . What about a pessimistic scenario like peak oil? How much impact can energy efficiency have in this scenario? Assume that the US can halve BTUs per dollar of GDP again by 2050, through a combination of increases in thermodynamic efficiency and increases in low-energy goods and services . This would only require a 1.75% annual increase in efficiency, not far above the historical average of 1.44%. A number of peak oil predictions indicate that oil production will be roughly half what it is today by mid-century. But energy efficiency increases alone could enable the US to sustain its current GDP at mid-century on half the oil! While a world of zero economic growth is alien today, it’s a far cry from the end of civilization as we know it. As long as renewable energy growth exceeds population growth, continued economic growth may even be possible in this worst of cases. When thinking about how a lack of energy would affect US life, imagine America without electricity, gasoline, and natural gas. The US as we know it would cease to exist. Also, strictly speaking, gasoline is not energy, but it and other fuels are often measured in terms of the BTU of combustion energy they contain. Here’s the spreadsheet with data. It makes more sense to look at the percentage rate of increase in dollars per BTU, instead of looking at the rate of decline in BTU per dollar. People can interpret positive growth rates more easily than negative decline rates, and so the data was graphed in this way. To do so, I inverted the data from the first graph (from BTU/dollar to dollar/BTU), and then measured the rate of change of the resulting data. At a compound annual growth rate 0f 1.44%, in 50 years the number of dollars per BTU will roughly double, which is the same as halving the number of BTU required to produce a dollar of GDP. 1.44^50 ~= 2. Similarly, an annual growth rate of 5% doubles efficiency in 15 years. The energy efficiency of an economy can be improved in two ways. First, the thermodynamic efficiency of energy production, conversion, and distribution can be improved, as discussed in this blog post. Thermodynamic energy efficiency can only be improved so much, as hard physical limits exist. But an economy’s energy intensity also decreases when goods and services that use energy less intensively become more common. For instance, email is much less energy intense than physical mail, and has in fact replaced a large percentage of physical mail. The entire media industry is much less energy intense than it was in the 19th century, when all media had to be consumed in person (at a concert/theater) or on paper. Consider also the difference in energy content between two different services: a $200 flight, and a $200 salon visit. If the US economy evolves in a way that makes it less energy-intense while still providing benefit to its citizens, this will generate substantial “economic” energy efficiency. Even before testimony concluded yesterday on Capitol Hill, reports with headlines like “Bernanke: Recession Certain in Absence of Bailout” and “Bush Administration Tells Congress to Act Quickly or Risk Recession” hit the wire services. Both Ben Bernanke and Hank Paulson stated clearly that a recession would occur if the proposed $700 Billion dollar bailout plan were not enacted. Similar threats of recession were used earlier this year when President Bush and Congress enacted a tax rebate stimulus program. Let me ask a simple question: why is everyone so afraid of a recession? Recessions and boom times are both natural parts of the business cycle in market economies, and the United States experienced twenty recessions (including the Great Depression) in the 20th century alone. Economic downturns, with the associated bankruptcies and layoffs, help trim inefficient investments made at the peak of economic cycles, thus paving the way for the next round of economic growth. The alternative to business cycles can be found in state-controlled economies, where inability to reallocate capital to new enterprises slows overall economic growth dramatically. Governments presiding over market economies also attempt to tamper with business cycles, and while intervention may soften the landing in a recession, it may also delay the recovery. Japan’s “lost decade” of the 90’s, where poor economic growth was the norm, resulted after Japan’s incredible economic boom of the 80’s. The extraordinary length of Japan’s recovery stemmed partly from the Japanese government’s inability to allow corporate and bank bankruptcies progress at the rate needed to clear out bad loans and start a new economic cycle. The US would do well to heed Japan’s allegory. Ideally, any intervention in the financial markets should enable orderly collapse and restructuring of businesses overridden with bad debt. No one gains in a financial panic, but an unwinding of the excesses of the US housing bubble is inevitable. Creative Destruction is at the heart of the business cycle, it’s at the heart of the American economy, and it will be necessary in this cycle as well. Let’s not make it take longer than necessary.